As the Albion embark on the new Premier League campaign, will the curse of ‘Second Season Syndrome’ strike at the Amex? Albion boss Chris Hughton, while being interviewed by Sky Sports this week, cited the overwhelming importance of a good start to the season, although the broadcaster was quick to point out the supposed difficulty of the Albion’s opening fixtures. In the first six fixtures, Albion take on both Manchester United and Spurs at home and travel to Anfield to take on Champions League runners-up Liverpool. On the flip side, they also travel to Watford and Southampton and entertain Fulham. This is the greatest league in the world, we all know that, so there is no such thing as an easy game. 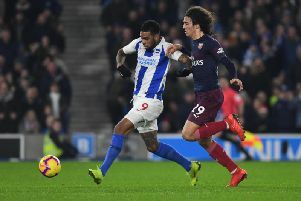 Premier League records tell us that the Albion collected a total of four points from the visits of Manchester United and Tottenham last season, and there’s a argument that it could have been six. The experience of last season, along with some shrewd and exciting business in the transfer market, will in my opinion see Albion hit the ground running at Vicarage Road this Saturday. For those first six fixtures, I think come the final whistle of the Spurs game, Albion will have at least eight points on the board, which would be a one point improvement at the same stage last season. And while a good start is important, bear in mind that after six games last season our good friends up at Selhurst Park hadn’t registered a single point, and Frank De Boer had already won the sack race. So it’s that time of the year for predictions. For the Premier League crown, after years of mocking Scottish football, Manchester City have real potential to mirror Celtic’s total dominance north of the border. The rest of the top six will fight it out amongst them. Liverpool have spent big, especially in the goalkeeping department, so that might be enough to clinch the runners-up spot. Many are already speculating that Jose Mourinho is engineering an Old Trafford exit, akin to his previous two departures at Stamford Bridge. The new bosses at Arsenal and Chelsea respectively will have seasons bedding in at their new clubs, and Spurs will also have a bedding in period at the new White Hart Lane. Sticking my neck out I see the top six: City, Liverpool, Arsenal, United, Spurs, Chelsea. At the other end, let’s cut to the quick, the Albion won’t go down. Cardiff, Huddersfield and one perhaps from left field, Bournemouth, will fall through the relegation trap door. Despite spending big on a couple of summer signings, there have been redundancies at the Vitality Stadium, including former Horsham FC boss John Yems, who was apparently a big part of Eddie Howe’s management team. Last season the stats tell us Bournemouth picked up a number of points with late goals, but at the other end their apparent defensive frailties saw them record the same amount of clean sheets as relegated Stoke. I think the wheels might be about to come off in Dorset, and it will be interesting to see what Howe will do if they are relegated next spring. As for the Albion’s predicted survival, it will in my opinion be comfortable as I can see them finishing in a mid-table position. In no particular order, they will finish above Fulham, Watford, Southampton, Burnley, Newcastle and Crystal Palace, as well as the aforementioned three. I’m sure it’s going to be equally as exciting as it was last season, so for the Albion faithful it’s time to buckle up and enjoy the ride.